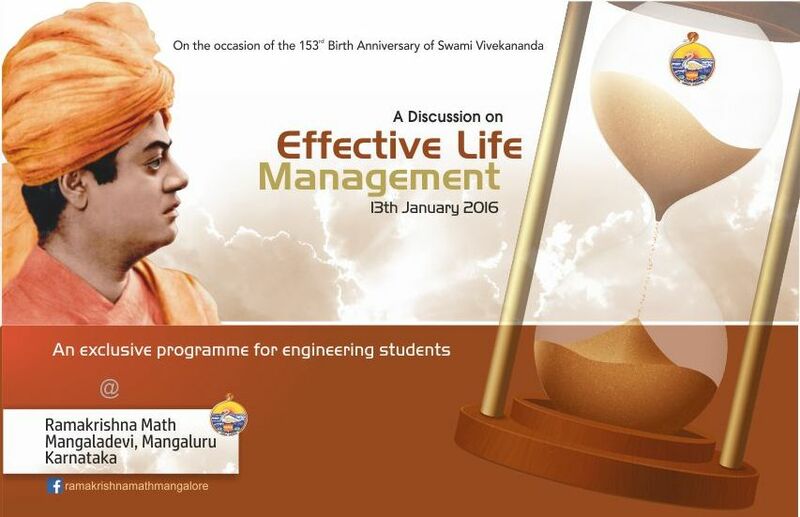 Seminars & Workshops | Ramakrishna Math & Mission, Mangaluru. 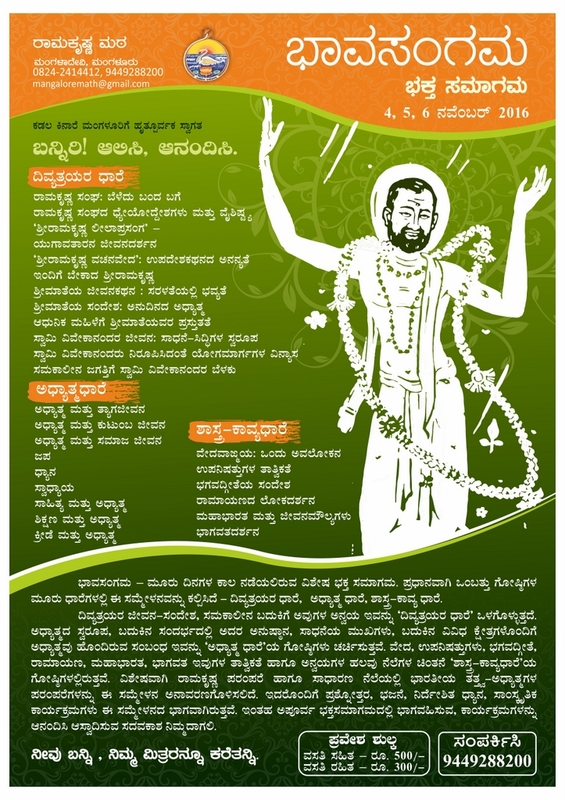 Ramakrishna Math, Mangalore is organizing Bhavasangama – Devotees Convention from 4th to 6th November 2016. We invite all the interested devotees to participate in the three days’ event. Accommodation will be provided for 3 days for devotees coming from outside for a nominal charge. 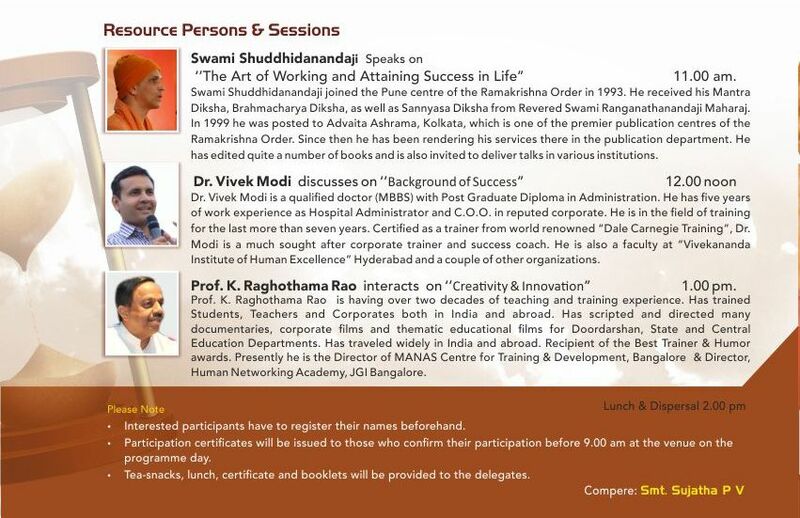 All the sessions will be in Kannada. Details of the convention are given below. Interested devotees have to register their names at the Ashrama office beforehand. “It is better to light a candle than to curse the darkness”, says an age old adage. Ramakrishna Mission at Mangalore took up the task of cleaning the city of Mangalore instead of blaming and cursing the filth and squalor that makes us turn our heads down in shame. We thank all the enlightened citizens who lent us helping hands and were instrumental in bringing about a change for the better. After successfully completing 40 weeks of Swacch Mangaluru Abhiyan in 2 phases in 2015-16 with the support of awakened citizens, our Ashrama is resuming the Abhiyan by initiating the 3rd phase from 2nd October 2016. This will comprise of about 40 groups in different parts of Mangalore, each comprising more than 50 members, carrying on the cleanliness drive on one Sunday every month for 10 consecutive months. Launching of the 3rd phase of the Swacch Mangaluru Abhiyan and felicitation of 75 Poura Karmikas who have strived to keep out city clean all along will be held in our Ashrama on the 2nd October. This will be followed by a Seminar on Swacch Manas for Swacch Bharath to highlight the importance of a shift in the mental attitude to ensure of success of this Abhiyan. Details of the programme are given in the following pages. We invite all the interested people who feel in their small action lies the future of our great nation to come forward and join this mighty cause. 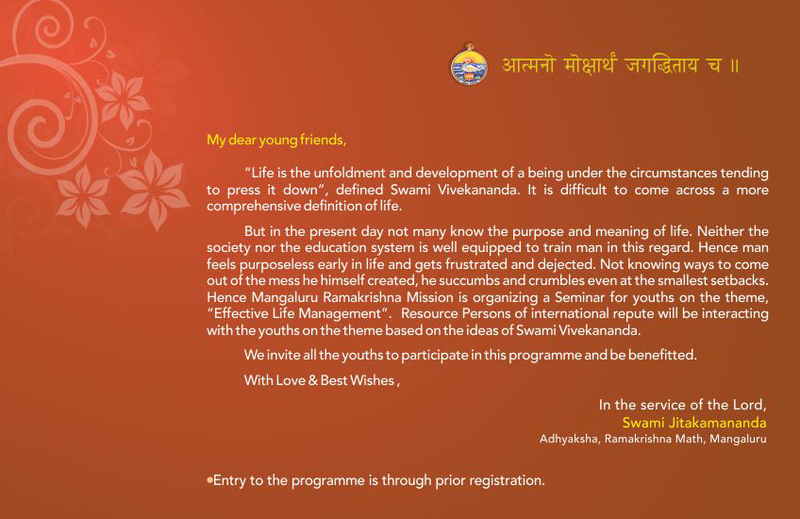 Ramakrishna Math, Mangalore is organizing Shraddha – 2016 – Seminar for Post Graduate Students on 1st September 2016 on the theme, “Education for Self-Reliance”. Sri Ananth Kumar, Honorable Union Minister for Parliamentary Affairs, Govt. of India will be inaugurating the programme. Details of the programme are given in the following pages. We invite the interested to register their names before hand and attend the programme on the 1st September. “Swacch Mangaluru for Swacch Bharath” is a novel initiative of Ramakrishna Mission, Mangaluru undertaken on special request from Government of India This initiative was flagged off on the 1st February 2015 in a special programme at Ramakrishna Math, Mangalore. In a nutshell its about 4000 youths dedicating their precious time on 40 weekends in 40 different wards of the Mangaluru city in cleaning and also in creating an awareness about cleanliness. Cleaning the nation is not a day’s job. Neither can this be achieved by just few legislations by Govt. agencies. It demands participation from each and every responsible citizen. Ramakrishna Mission has always stood in the forefront in the service of the society. We seize this opportunity to serve the nation through leading from the front by taking up this cleanliness drive. Our motive is not to sweep Mangalore clean, but to create an awareness among the people, particularly in the younger generation about its importance and their role in keeping their surroundings cleaner and greener. On this occasion we would also like to thank Nitte Group of Institutions and MRPL for their continued support, cooperation and patronage for this initiative. In the 1st phase, about 20 drives were successfully organized in different parts of Mangalore thanks to the dedicated efforts & support of the volunteers, devotees and well-wishers. Now that we enter the 2nd phase of the Abhiyan we would appreciate if more & more volunteers join our brigade to help us realize our tryst with destiny. We hope interested public will utilize this unique opportunity to pay back to society by contributing their mite in the national regeneration. A special programme, “Darshana – The Vision” for three days, from 24th to 26th September in our premises for students of Post Graduate studies and Degree students. All the interested are requested to participate in the programme and be benifitted. Entry to programme is through prior registration. India’s government is pledging $500,000, plus more in travel expenses, to the Art Institute of Chicago as part of a new professional exchange program between India and the museum. India’s Ministry of Finance announced Thursday the establishment of the Vivekananda Memorial Program for Museum Excellence, which honors Swami Vivekananda, who gave a landmark speech about religious freedom at the first World’s Parliament on Religion, held Sept. 11, 1893, in the building that became the Art Institute. Art Institute spokeswoman Erin Hogan said in addition to $500,000 in grant money, the Indian government will cover significant travel and lodging expenses over four years as Art Institute staffers present lectures, workshops and seminars in India, and Indian fellows visit the Art Institute. “The program involves teams of people traveling repeatedly to India and the United States,” said Hogan, noting that the museum will create four to six fellowships each year for Indian museum leaders and will serve as a resource center on best international practices in such areas as conservation; collection storage, display and expansion; visitor facilities and services; and multimedia content production and staff training. The Art Institute will host Indian cultural and political leaders, including Minister of Culture Shri Pranab Mukherjee, at a ceremony Saturday evening in which the new program will be announced, the site of the Swami’s speech will be rededicated with a prominent plaque and a new exhibition on loan from the Indian government, “The Last Harvest: The Paintings of Rabindranath Tagore,” will be celebrated. The Indian government also announced a $1.5 million endowment at the University of Chicago to create the Indian Ministry of Culture Vivekananda Chair to promote “fields of study most relevant to (the Swami’s) teachings.” The university will host a ceremony Saturday afternoon. In connection with Swami Vivekananda’s 150th Birth Anniversary Mangalore Ramakrishna Math had organized a Two – day seminar for B Ed students and for Degree students in Ashrama premises on the 21st & 22nd September 2011. On the 22nd, the seminar was inaugurated by Smt. Lekshmi Kumaran, DGM, MRPL, Mangalore. Smt. N C Seethamma, Project Director, ZP, Dakshina Kannada was the chief guest. About 500 Degree students from different colleges in Mangalore participated in the event. Dr. K S Sameera Simha, Chairman, Silicon City Education Avademy, Bangalore, Dr. Usha Vasthare, Founder, Yogakshema Rehabilitaion & Wellness Centre, Bangalore & Smt. Sudha Sharma, writer & Media Personality were the resource persons. All the participants were gifted with complimentary booklets. Deserving students were awarded scholarships on behalf of our ashrama by the guests on the 22nd September. About 1.2 lacs worth of scholarship was awarded to about 90 deserving students pursuing higher education in different colleges. On the 21st, the seminar was inaugurated by Sri P Jayaram Bhat, Managing Director, Karnataka Bank; Mangalore Dr. Mohan Alva, Chairman, Alva’s Education Foundation, Moodbidri was the chief guest. About 550 students from different B Ed colleges in and around Mangalore participated in the daylong seminar. Dr. K S Sameera Simha, Chairman, Silicon City Education Academy, Bangalore, Dr. Usha Vasthare, Founder, Yogakshema Rehabilitation & Wellness Centre, Bangalore & Smt. Sudha Sharma, writer & Media Personality were the resource persons. All the participants were gifted with complimentary booklets. In connection with 150th Birth Anniversary Celebrations, Mangalore Ramakrishna Math is organizing Seminar for B Ed students on the 21st September and Youth Convention for Degree students on the 22nd September. Scholarships will be distributed to deserving students on the 22nd September. Entry to these programmes is through prior registration and all are requested to attend and be benefited by the proceedings of the seminar. In connection with Swami Vivekananda’s 150th Birth Anniversary Mangalore Ramakrishna Math had organized a seminar for Headmasters for Dakshina Kannada highschools in ashrama premises on the 27th August 2011. On the 27th, the seminar was inaugurated by Sri Vishweshwara Hegde Kageri, Hon. Minister for Primary & Secondary Education, Govt. of Karnataka. Sri D H Shankaramurthy, Speaker, Karnataka Legislative Council and Sri Yogish Bhat, Deputy Speaker, Mangalore Legislative Assembly were the guests besides several other prominent members of Education Dept. About 400 headmasters from different schools of Dakshina Kannada Dist. participated in the event. All the toppers of the 10th std exams held recently were honored along with schools scoring cent percent result. Swami Nirbhayananda Saraswathi, President, Ramakrishna Vivekananda Ashrama, Gadag and Prof. Raghotham Rao K, Director, Manasa Foundation, Bangalore were the resource persons. All the participants were gifted with complimentary booklets. In connection with Swami Vivekananda’s 150th Borth Anniversary Mangalore Ramakrishna Math had organized a seminar for Post Graduate Stiudents in Social Work in Math premises on the 26th and 27th August 2011. On the 26th, the seminar was inaugurated by Sri Alok Mohan, Inspector General of Police (Western Range), Mangalore. 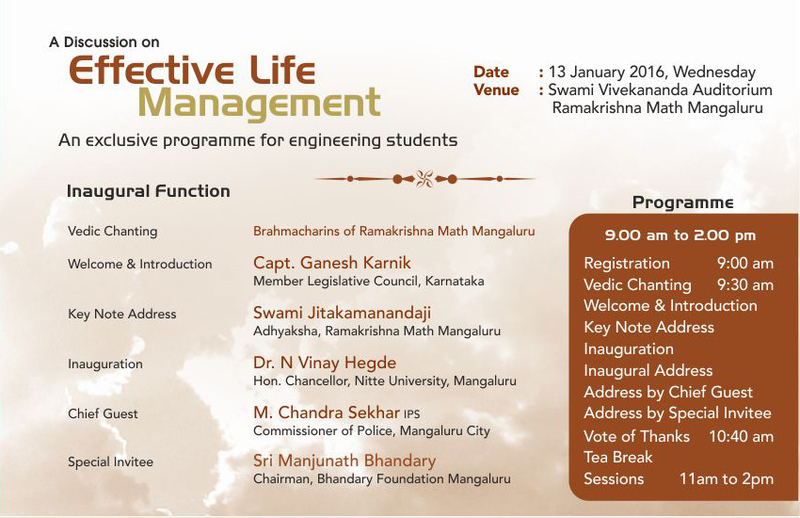 Prof. T C Shivashankara Murthy, Vice Chancellor, Mangalore university was the chief guest. About 550 students from different colleges in and around Mangalore participated in the daylong seminar. Swami Nirbhayananda Saraswathi, President, Ramakrishna Vivekananda Ashrama, Gadag and Prof. Raghotham Rao K, Director, Manasa Foundation, Bangalore were the resource persons. All the participants were gifted with complimentary booklets.